The other day I was making some m&m cookies and when I got to the bottom of the bag there was some m&m dust-like bits left. I thought it looked kind of pretty and would be fun added to a cookie:) Hence, m&m confetti cookies were born! 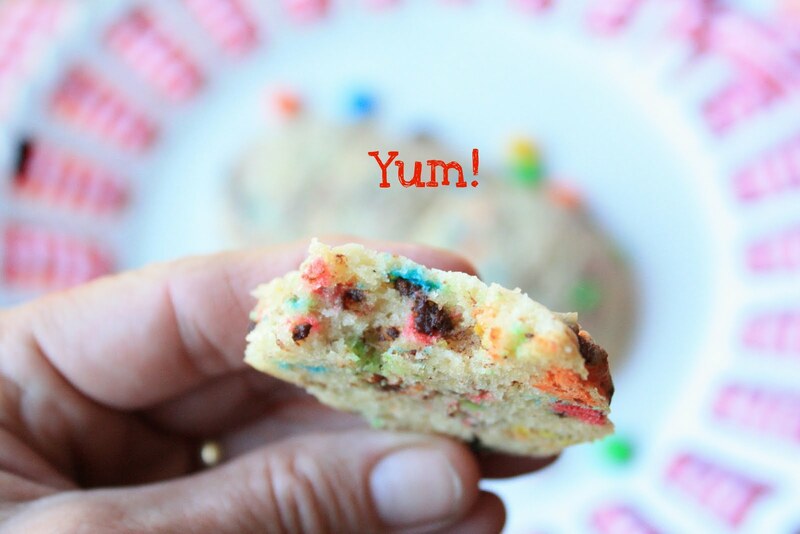 I searched for a recipe and found a sprinkle cookie recipe on Stephanie Cooks~Thanks Stephanie! 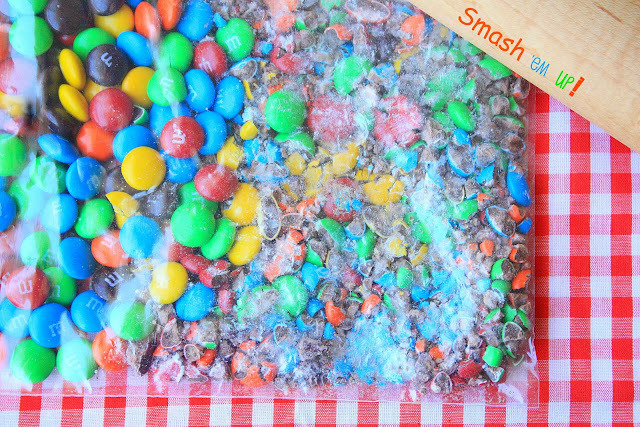 Before you start the cookies, place some m&m's in a ziploc bag and use a rolling pin to smash them up! It actually worked better to whack them with the rolling pin more than it did to roll over them with it. I ended up using about 1 cup of candy bits. Even at this stage they look pretty! And in the end, they are wonderful! 2. Combine the flour, baking powder, and salt in a medium mixing bowl and set aside. 3. Combine the butter and sugar in a large mixing bowl with an electric mixer on medium-high speed until fluffy, 2 to 3 minutes. Add the eggs and vanilla and beat until smooth. Stir in the flour mixture until just combined. 4. Stir in 1 cup of the m&m confetti bits and mix well with a wooden spoon. 5. Use a medium (walnut size) cookie scoop and place cookie scoops on parchment-lined baking sheet(I used my stoneware~no need for parchment) about 3 inches apart. 6. Bake for about 10 minutes or just until the edges begin to brown. 7. Allow cookies to cool on the baking sheet for about 5 minutes before transferring to a wire rack to cool completely. Makes about 2 dozen cookies. Adorable. Delicious. I stumbled it ;) Congrats on your new grand-munchkin!! Great idea! Very colorful too. What a good idea. It does look very pretty and I am sure it tastes even better. I invite you to link this to Bake with Bizzy. They look so colorful and cute. I bet they are so tasty too. Ohh these are super cute. I have just been on holiday to California and I was impressed with how many different varieties of m&m's they had - my personal favs were the pretzel, peanut butter and coconut. I love m&m cookies! These are so pretty with the little confetti pieces. I'll need to try this for sure! Ooh they're so pretty and colourful! :D Love them Sue! These very colourful cookies will be a great hit amongst the kids. I love this idea! what a great idea!! I can't wait to try this! This is my kind of cookie! I like the little mini M&Ms in cookies but this is even better! ANd they look so cool!!! These are so colorful and delicious looking! They look so pretty and they'll taste so much better than regular sprinkles! So colorful and pretty, Sue! You never fail to amaze me with your creations! These are adorable... my girls would love them! I LOVE this idea! I am shortly going back to uni and this is the perfect recipe that i know will please everyone :) such gorgeouuss photos too, lovely, thank you! Fabulous idea! So much better than sprinkles. I love that you came up with this idea, the cookies look great. 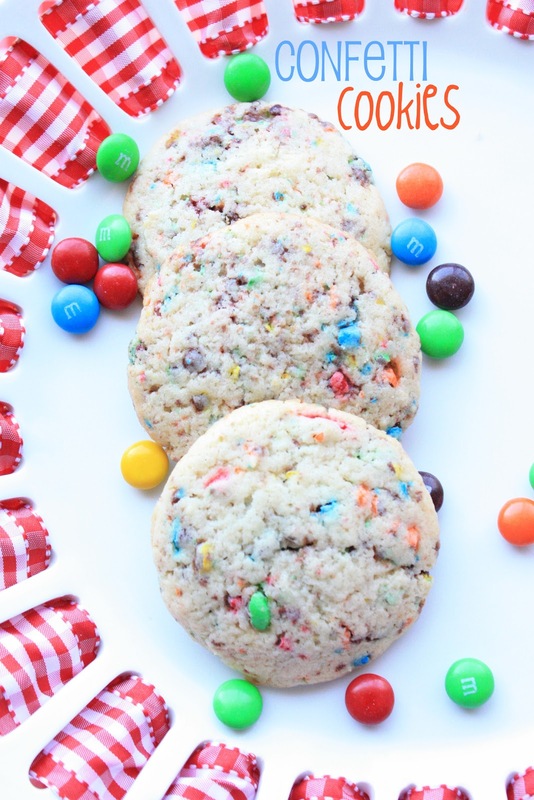 I recently discovered Peanut Butter M&M's, what a great confetti cookie they would make too. Very pretty and colourful cookies. wow, these look and I bet TASTE awesome. BTW, your comment on my blog was so nice. I appreciate it very much and know the time it takes to do that! I think I would like these better than regular - a little M&M in ever bite. They are sure pretty like this. How pretty these are, sweet ide. what a super fun cookie, I love how you look at the final bits of the M&M's and don't see dregs but a fun new cooking medium to use. That's what makes you so creatively special. Wow these look so delicious! Are these a soft cookie or a crispy cookie? I love it ! So colorful! Those are just tooo cute en lovely! They are really happy cookies! Tried onces with whole peanut m&m's, but the cookies were very big (dûh) and crumbled a bit too much for my taste. Love them! Found them via http://daily-teacup.blogspot.nl/2012/02/188365.html?showComment=1340308230669#c388255091227086128 and now looking around here :).